Ironically, VR is not new and has been around, believe it or not, since the 60’s! But the hype has really picked up in the last 2 years with eight of the world’s biggest tech companies releasing consumer VR headsets last year, and the world’s top platform companies Facebook and Google also jumping on-board. Most people describe virtual reality or VR, as the use of computer technology to create a simulated environment. But with the introduction of Google Street View, You Tube VR videos, VR photographs, etc, VR is not only experienced in simulated fictional environments but in actual environments that do exist as well. In a simulated environment, the scene that you are viewing has been computer generated – created to look like a real environment. While in VR experiences where the environment really does exist, the scene has been captured by using a 360° or VR camera. But whether in a simulated environment or a real one, VR gives users the feeling of being inside and part of the world that they are viewing. This experience is immersion. By simply putting on a head-mounted display (HMD), users feel like they are in the scene that they are in and are even able to interact with the environment around them. Too often though, when discussing VR, confusion sets in when VR, augmented reality and 360° video are used interchangeably – but they’re not the same thing. Both virtual reality and augmented reality (AR) create immersive experiences, but the key difference is just how immersive. With VR, a user enters an entirely immersive world and is cut off from the real world around them, while in AR, the user can still interact with the real world and can see both the real and the virtual world. 360° videos or photos are not virtual reality. With 360°, you can look around in the VR content that has been created, but unlike VR, you can’t navigate it or control anything beyond the direction you’re looking at. The animated graphic illustrates this perfectly. With VR comes exciting new and innovative opportunities for a number of industries. Using VR, businesses can offer consumers the chance to experience their products and services in innovative and exciting ways. 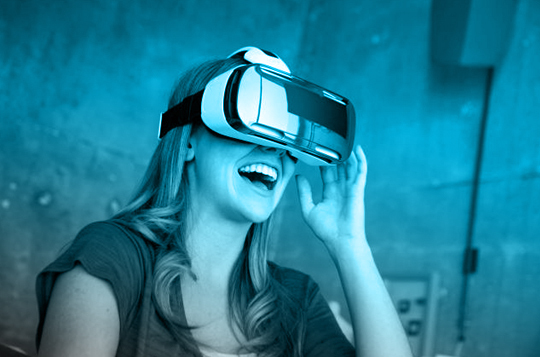 Brands can now provide immersive experiences to consumers that were previously not possible. VR in architecture allows architects to experience being in a building space that hasn’t even been built yet. It can also demonstrate any issues with the building structure before it’s built, avoiding costly post-build alterations. The intensity of a VR experience is far greater than traditional marketing methods. VR experiences generate strong emotions in its users and studies have shown that users also feel more connected and engaged to a brand. VR enables product designers to test a prototype without having to develop several versions. This saves time and money. Real estate agents are using VR to sell houses. VR provides 360-degree virtual property tours of homes allowing potential buyers to be inside the room they are viewing. VR allows for guided tours of any place around the world. With VR, people can now get a feel for destinations when choosing their holiday destinations. Brands are creating virtual tours of their business environments and using them for inductions, orientations, product launches and training of new employees. VR allows retailers to showcase their products and services. With VR, teachers can take students on immersive, virtual journeys to anywhere in the world – museums, underwater, even outer space! VR is being used in medicine to create realistic virtual environments or models of the human anatomy. This assists healthcare professionals to gain insight into what they will experience before actually working with a real body. These are just a few industries mentioned here but the list is growing almost daily. We can expect to see many more innovative uses for VR in the future and possibly a fundamental way in which we communicate. contact 3DGuy to setup a meeting.